Today I'm continuing to participate in the second annual brunch week co-hosted by Terri of Love and Confections and Susan of The Girl In The Little Red Kitchen. From May 5th to 11th, a group of over 30 bloggers are celebrating the deliciousness of brunch. In addition, we have some amazing sponsors who have donated great prizes for a gigantic giveaway so please see below for more information. One of my favorite things about dining in a high end French restaurant is that I'm likely to find a souffle on the dessert menu. They have to be cooked to order so the waiter will always ask if you'd like to pre-order it when you decide on the rest of your meal. I always do. But I never considered making it at home. Too difficult, too much work. I'll get my chocolate souffle fix when I dine out. The possibility of a savory souffle never even occurred to me until I watched The Barefoot Contessa make a blue cheese souffle. A non sweet souffle? I loved the idea right away and it sounded like the perfect brunch item. I absolutely had to make it myself. Although it does involve separating eggs, a chore I dislike, it turns out that making souffles is not as hard as I thought. And the flavor possibilities are endless. This bacon and corn version was sublime and I won't be waiting for a special occasion to make it again. Enjoy! Pre-heat the oven to 375 degrees. Add the corn kernels and milk to a blender and puree until smooth. In a large skillet, melt the butter and whisk in the flour until thoroughly combined. On medium heat, whisk in the corn mixture and continue cooking for a few minutes until it thickens. Remove from the heat, add the crumbled bacon, cheddar cheese and scallions. Season to taste. Separate the eggs and whisk the yolks into the corn mixture. In a separate bowl, beat the egg whites until they form stiff peaks and gently fold them into the corn mixture. Butter two 15 oz. ramekins (or 4 smaller ones) and coat with the breadcrumbs. Pour half the corn mixture into each ramekin. Bake at 375 for 10 minutes, reduce the heat to 350 degrees and bake for an additional 15 minutes. 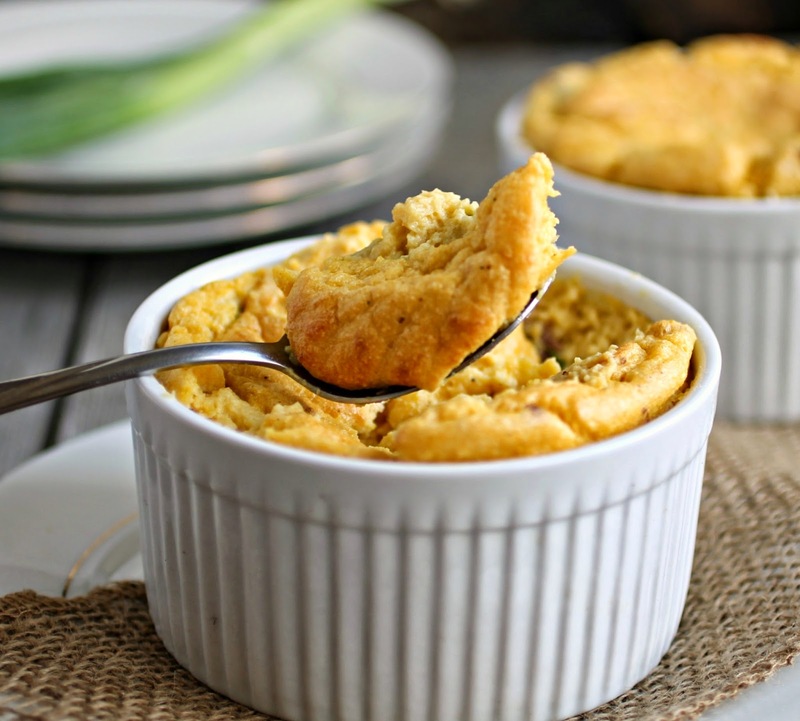 The souffle will be tall when they first come out of the oven but will fall quickly so serve immediately. Makes approximately 4 servings. Please click HERE to see all the great sponsors and prizes and to get your chance to enter the raffle. Note that you are not being directed to another site, merely to another page on Hungry Couple. Good luck! Please check out the other delicious recipes from all the bloggers participating in Brunch Week. Souffle making scares me! But with bacon and corn? My face needs that! Pinned! Oh, my! This looks AMAZING!!! I need to find an occasion to whip this up ASAP! Gorgeous souffle! This is a total family favourite. 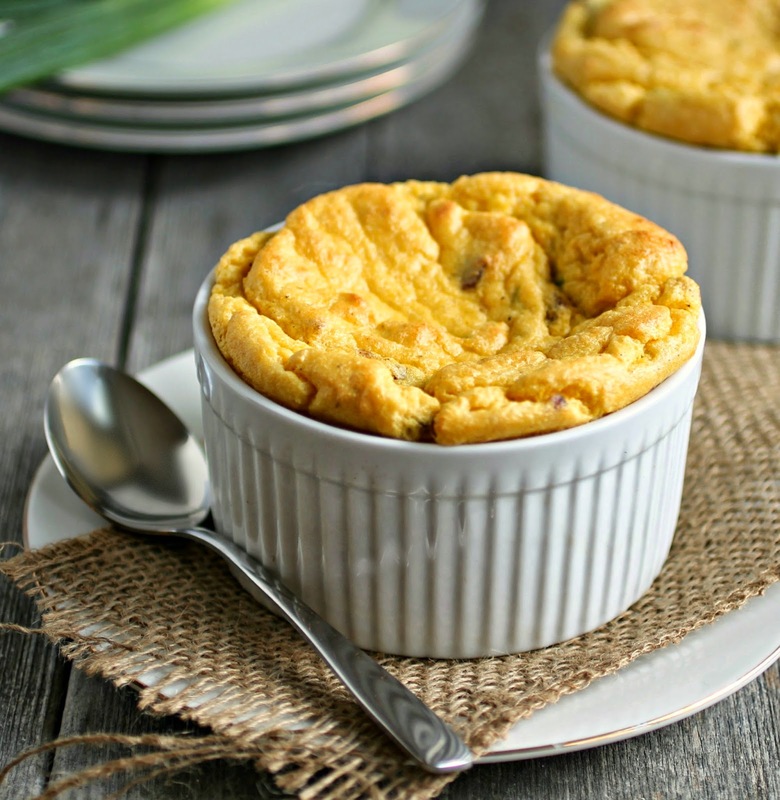 I've had souffle on my culinary bucket list for TOO long! It's time to make one. Yours is beautiful! Dang Anita, another fabulous dish!!! LOVE this one so much! I love dishes that can be served in little individual servings. It just makes it seem that much more special. These look great, and I love the idea of endless possibilities! I'm terrified of souffles too. But this one is just too pretty to pass up! LOVE souffles! I need to make another savory one too! Good Job Anita! Yes please! 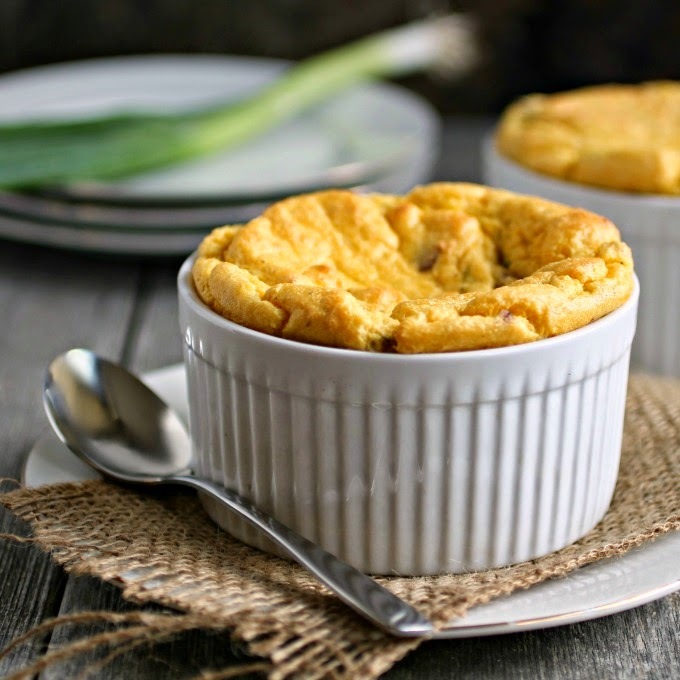 Souffles are so delicious and light! Oh my gosh, I have like 8 lbs. of blue cheese in my fridge right now from a recipe development job, so I really need to check out that Barefoot Contessa recipe. But your flavors here look so great that it'll be hard to not make this one, too. Love the combo of the sweet corn with the salty bacon! Mmm what a delicious sounding savory souffle. Oh my - I'm pinning this several times so I won't forget to make it this weekend! YUM! Souffle's scare me, but I need to get over it! This looks fantastic! Oh man! I love this! And how can you go wrong with a corn/bacon combo! Pinning! The combo of sweet corn and savory bacon just sounds amazing! Bacon makes everything better. I can't wait to try! Looks like your soufflé worked out! It looks beautiful. I personally enjoy savory soufflés more than sweet. I've never made souffle! Way to go, you did awesome!